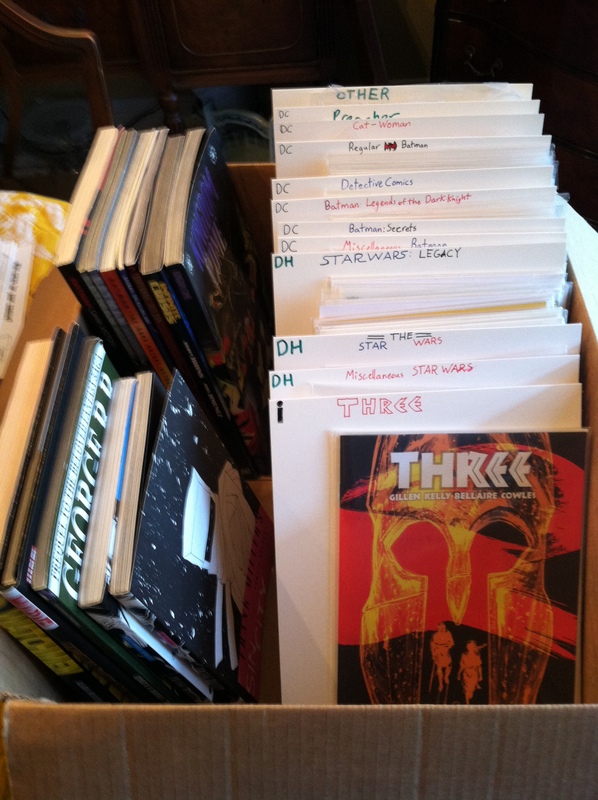 Yesterday I finally did something I’ve been meaning to do for years, organize and file my comic books. It took me the better part of a morning, but I’m terribly pleased with the general sense of imposing order on chaos. I am no more than a dabbler in comic books. 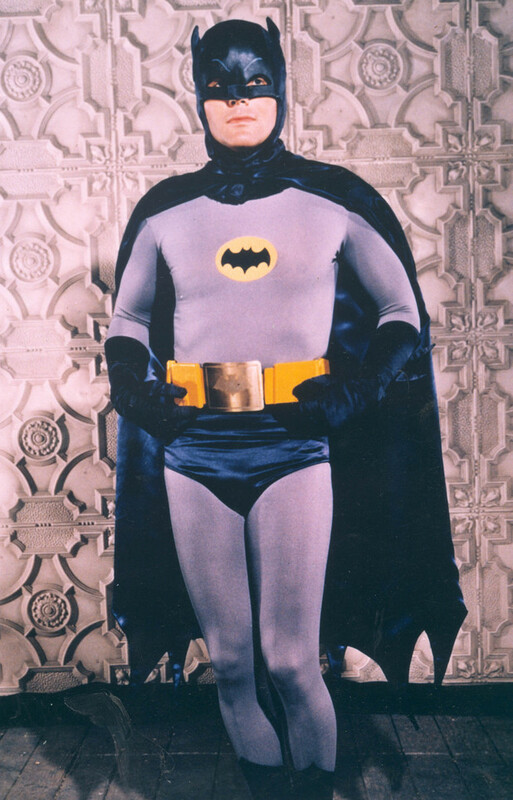 I read them sporadically as a kid – Mostly Batman, in the wake of the 1989 film (although I do have a vintage, wrinkled Transformers comic, from that long plotline when Optimus Prime had had a core dump or something and Ratchet was leading the Autobots). In recent years, I’ve put my money in large-scale graphic novels, to the idea of getting more for my buck. I’ve got the Alan Moore masterpieces (Watchmen, From Hell), a few of the “classic” Batman Graphic novels (The Dark Knight Returns, The Killing Joke), a few lesser-tiered (Dark Victory, Hush), and some of the USE-ALL-THE-DC-CHARACTERS tomes, Infinite Crisis and such. I also have the Batman that was on the shelves in November of 1976, when I was born. Birthday present from my wife, who – bless her – encourages my nerderies. Yeah, I’m a DC kid. Deal. Above: Still cooler than Wolverine. But I also like what Dark Horse has done with the Star Wars universe. Which is to say, I really got into the Star Wars: Legacy storyline for a while there. Cade Skywalker, who is Luke’s great-grandson, is an interesting cat: part Anakin, part Han Solo, and the Sith characters sizzle nicely. I stopped buying them for some reason, but it was probably financial. A few months ago I was pulled back into the comics world by Dark Horse’s latest creation: The Star Wars, a limited serial based on George Lucas’s 1974 rough-draft screenplay. Three issues in, and it feels like someone translated Star Wars into Japanese and then translated it back (insert obligatory reference to Kurosawa’s The Hidden Fortress here): the words are there, but they’re all out of order, yielding an entirely new story. Which is the point. How the hell did Whitsun make it to Aquilae, especially after some villain or other stomped the snot out of him? In issue #1, he’s on Coruscant, in a bar, unable to arrange transport anywhere. Then he’s suddenly in Aquilae, looking like the Sons of Anarchy just worked him over. Who is Anakin talking to during his dinner with the King and Queen? No one said anything to him or mentioned anything about being anyone’s padawan. Does he have Exposition Tourette’s or something? Who’s the chickadee Anakin is nearly smooching with before Luke shouts out “Where the hell is Starkiller?”, and where is she in relation to Luke’s command center? When I picked up issue #3, I also happened upon the first issue of a new book from Image: Three. 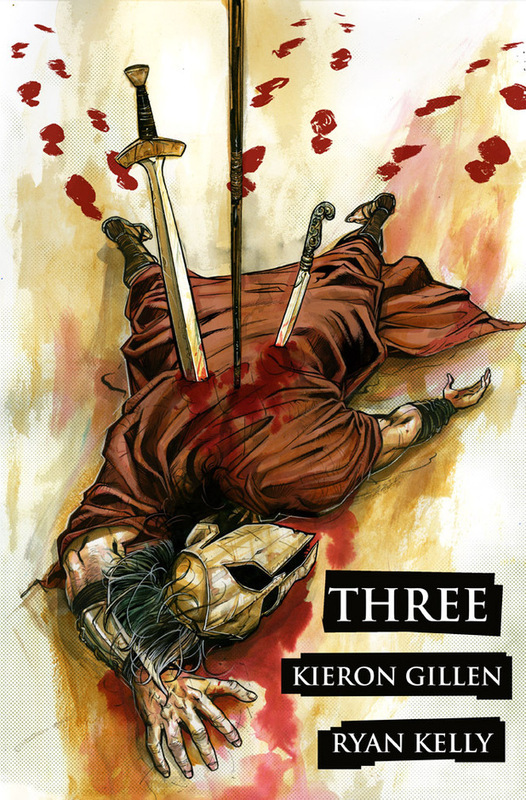 A riff on Frank Miller’s 300, it tells the story of three helots in post-Peloponessian War Sparta who decide to stick it to the Red-Cloaked Man. So far, it’s fantastic, and I can’t wait to see if they weave the Theban/Macedonian conflict into the story (it’s set in 364 BC, the year Phillip II left Thebes to return to Macedon). That’s that. I’ll follow-up next month with whatever new comes across the transom, and probably get into the political messaging of Superman: Red Son.